Established in August 2001 as an Ecology department, since 2004 the department has functioned under the name of Ecology and Natural Resources. 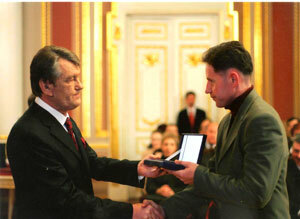 Headed by Full Professor, Doctor of Letters and the author more than 275 research papers, 12 handbooks and several monographs V. Burlaka, the department boasts qualified staff, which includes: Associate Professors O. Harbar, O. Uvaieva, M. Kryvyi, I. Yevtushok, Assistant Professors I. Onyshchuk, O. Vasylenko, instructors A. Kukharchuk, I. Khomiak, I. Kotsiuba. Three research laboratories function at the department: «Cytogenetics and ecological and genetic monitoring of environment», «Ecosystemological environmental monitoring», «Environmental thermodynamics». The department supervises the work of the «Society for Nature Conservation», which together with the Environment Preservation Society of Koroliovskyi District initiated several scientific conferences devoted to the ecology of the city area and Polissia region. Research at the department is conducted in the following directions: ecology and education, ecology of freshwater gastropods; influence of feeding and radioactive pollution on animal homeostasis: monitoring ecosystems of Zhytomyr region, in particular the Ovruch-Slovechansk ridge using international environmental programs. Since the department was established, its staff authored three monographs, more than 180 research articles in the leading Ukrainian and foreign journals, a collection of research papers and took part in international as well as regional conferences. 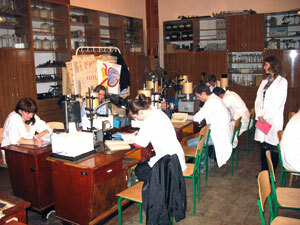 There are two research groups at the department: «Ecological system differentiation and analysis» and «Human anatomy». The staff have worked out training aids for all the courses taught by the department, including practical and laboratory classes. The European credit system is introduced in student training and assessing, lectures are being prepared for online sharing, the methods of modeling and mapping for various ecological studies are being developed. Four textbooks, three monographs and five training guides were published, including: «Modern detergents: technological, ecological, economic and application aspects» by V. Burlaka (2004), «Cynology: maintenance and feeding. Handbook» by V. Burlaka (2004), «Ecology of waste. Book 1» by V. Burlaka, T. Suknenko, I. Khomiak (2007), «Ecology of waste. Book 2» by V. Burlaka, M. Kryvyi, V. Borshchenko, «Exotic Animals Feeding» (2007) editor in chief - V. Burlaka, “Planorbinae Molluscs in Ukraine» by O. Uvaieva (2007). In 2004 the department received a patent for «Ways of producing vermicompost and fodder supplements”(by V. Burlaka, V. Shevchuk and others). The department collaborates with the Institute of Zoology, the Institute of Hydrobiology at the NAS of Ukraine, Ivan Drahomanov National Pedagogical University , Pavlo Tychyna Uman Pedagogical University and Lviv Museum of Natural History at the NAS of Ukraine. It provides training help to Zhytomyr schools №24, №28 and №34, as well as schools in Denyshi and Ozerne villiages. The branches of the department function at meat production factory LLC «Miaso Polissya», water utility of Zhytomyr and sewage treatment facilities of Zhytomyr.